Action from St Leonards Cinque Port's (yellow, blue, black) 7-18 defeat against local rivals Rye. All pictures by Simon Newstead. 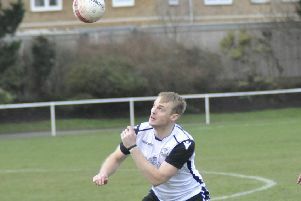 St Leonards Cinque Ports Rugby Club were beaten 18-7 at home to local rivals Rye last Saturday. As the wind and rain swept in across the Ark William Parker Academy pitch, from the off the weather was the clear controlling force in this Sussex Division Three East local derby. Action from St Leonards Cinque Port's 7-18 defeat against local rivals Rye. Both sides spilled the ball. The scrum was a solid platform for Ports and Sion Hughes-Gage drove well from the base of the scrum after the first of many injuries befell Ports. Murray Warman intervened when a kick ahead almost gave Rye a score and was unlucky not to score in the corner at the other end. Another Rye spillage was swooped on by Warman, who got close to the line before feeding Luke Barningham and he dived over. The nerveless Barningham slotted the conversion. Ports looked set to reach half-time in front, but a well-worked scrum brought Rye level at 7-7. Injuries left Ports looking very different in the second half, but Max Olujobi was dangerous and at one point made his way through six tacklers. Rye drove the ball well. A penalty gave them the lead and a well-worked try following a lineout extended their advantage. Another penalty put them 11 points clear and although Ports fought back, Rye were solid in defence to see the game out. Chris Perry and Barningham shone, but Ports’ E-Heat man of the match was Chopper Gooders, who tackled fearlessly and was a dancing runner. Ports: Hutchins, Warman (Adey), Pearce (Olujobi), Standen (Barrowclough), L. Barningham, Hill (Hall), Hall (Davie), Freeman, Whyte, Monks (Wan), Perry, Mountain, Scriven (C. Barningham), Gooders, Ingram (Hughes-Gage). Sub not used: Wright. Ports are due to host Crawley 2s on Saturday.